A gunman opened fire on multiple people at a country music bar in Thousand Oaks, California Wednesday night (Nov. 7), killing at least 12 people, including a sheriff’s deputy, and injuring several others. The shooter was killed by deputies who arrived at the scene. The sheriff’s deputy who was fatally wounded was identified as Ron Helus, a 29-year veteran of the Ventura County Sheriff’s Office. Police said “at least 200 people” were inside the Borderline Bar, which was hosting a “college country night” gathering for students. 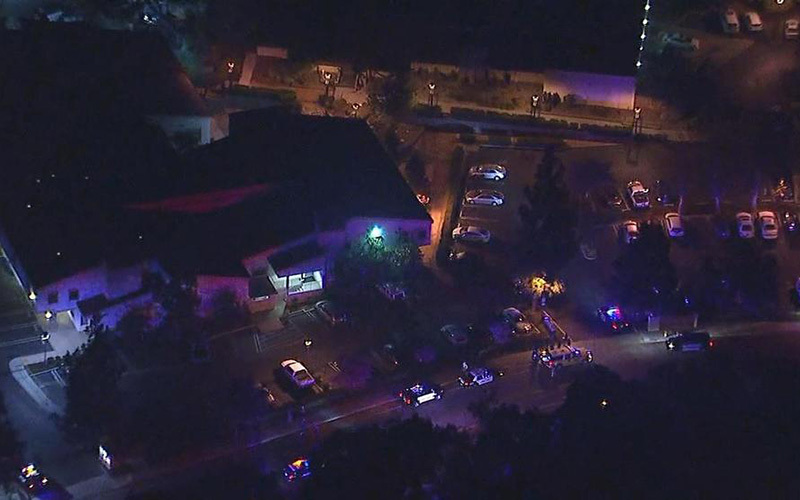 Ventura County Sheriff’s Sergeant Eric Buschow told reporters on the scene there were “multiple fatalities.” Captain Garo Kuredjian said he could not comment on the status of the victims, however, the number of victims was expected to rise. Among the victims was a Ventura County deputy sheriff, a doorman, a cashier and college students. The lifeless body of a suspected male victim was seen on KABC-TV helicopter video outside the bar. Captain Kuredjian said there was no immediate threat to the public and homicide investigators are at the scene investigating. The gunman—reportedly dressed in all-black, wearing a trenchcoat, glasses, a baseball cap and a mask covering the bottom part of his face—opened fire at around 11:20 p.m. (2:20 a.m. ET Thursday). One officer was injured when he arrived at the scene with colleagues and “attempted to neutralize the threat,” Capt. Kuredjian said. Witnesses said the shooter fired at least 30 shots from a pistol with extended mags and threw smoke grenades. “I thought it was a joke when the shots started firing. I know people there. I hope everybody’s OK. I don’t know how I didn’t get shot,” John Hedge told KABC. According to news reports, people were hiding from the shooter in bathrooms and attic spaces in the bar, while others who managed to escape the venue ran to nearby gas stations for medical help. Some people reportedly had to use chairs to break windows inside the bar to escape. The Los Angeles Times reported that one woman was in the front of the restaurant with more than a dozen friends when the gunman came in and started shooting at the ceiling. She said a friend threw her onto an outdoor balcony so that she could escape. She said she was afraid some of her friends were still inside the bar. Witnesses have said that many people at the bar also attended the Route 91 country music festival in Las Vegas in October 2917, where the worst mass shooting in modern U.S. history claimed the lives of 58 people and injured 851 others. Captain Kuredjian said it’s been a while since shots were fired in the city. He said the area is safe and shootings are a very unusual occurrence. In fact, Business Insider called Thousand Oaks, which is about 40 miles west of Los Angeles, the third-safest city to live in in the United States.